For years, it seemed like Marvel would forever win the Comic Book Movie Box Office war. Not even DC’s cavalcade of crooks in Suicide Squad could derail their rival’s dominance. But in 2017, things changed. The release of Patty Jenkins’ Wonder Woman levelled the playing field with a film that was both extraordinarily entertaining and, more importantly for the studio, a financial success, eventually taking in a Worldwide haul of $821 million dollars. A solid if a little disappointing return for Avengers-eqivalent ensemble Justice League followed a few months later but it wasn’t until the solo outing of League member Aquaman in December 2018 that DC confidently reaffirmed their place in the Box Office battle, earning an outstanding $1.12 billion around the World. Now, Warner Brothers have revealed when Aquaman will emerge from Atlantis to make a splash on Home Entertainment formats. 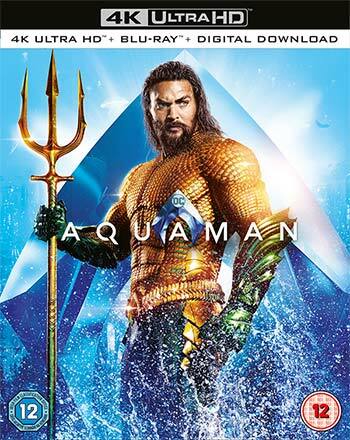 On April 6th 2019, The King of the Seven Seas will debut on Digital Download before ruling the 4K Ultra HD, 3D Blu-ray, Blu-ray and DVD charts on April 8th 2019. And he’s bringing DC’s next release Shazam! with him – well, three minutes of exclusive footage from the movie. The sneak peek will be available to anyone who picks up 4K Ultra HD, 3D Blu-ray or Blu-ray copies. Shazam! is set for release on April 5th 2019, so if you don’t manage to catch it opening weekend but are planning on picking up Aquaman then it should sufficiently, ahem, tide you over. James Wan: World Builder–James Wan has created one of DC’s most ambitious films. With his help, we’ll take a deeper look at the inherent challenges and solutions James faced in both performances and visual effects in order to bring a new world to life. Looks like all bases of the films creation are covered there. One of the biggest praises for Aquaman has been its depiction of Atlantis, so it’ll be interesting to see the years of work that went into creating it. With news of Aquaman 2 now in development as well as a horror spin-off featuring the Lovecraftian Trench Monsters tentatively titled The Trench, the future’s looking especially bright for The Aquatic Ace and DC’s Extended Universe as a whole. The two horror sequels from the 90's will be coming to Blu-Ray for the first time in the UK in March with, as always, a slew of special features. If it's a classic ghost tale you're after on those dark Autumn evenings, there's no excuse to not let The Fog's eerie atmosphere (now in 4K!) roll into town with one more story before midnight.